Zimbabwean President Robert Mugabe has arrived in Rome for the beatification of the late Pope John Paul II. An EU travel ban forbids him from visiting member states but the Vatican, where the ceremony will take place, is a sovereign state and not in the EU. 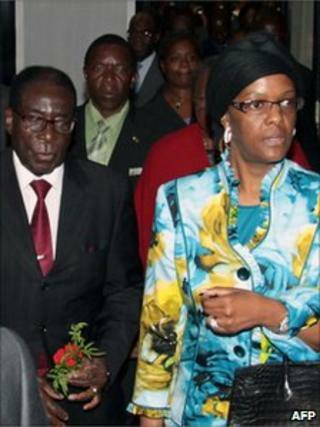 Mr Mugabe, a Roman Catholic, has been allowed to transit through Italy. Despite the travel ban, Mr Mugabe went to Rome for the funeral of John Paul II in 2005 and for UN food agency conferences in 2008 and 2009. The sanction on Mr Mugabe was imposed in 2002 over human rights abuses. Italy's foreign ministry said it had requested an exemption from the EU travel ban for Mr Mugabe. A Vatican spokesman said Mr Mugabe had not been personally invited but as the head of a state with which the Vatican has relations he was entitled to attend. In all, 22 world leaders will be in Rome to celebrate the beatification of the Polish-born Pope. A Vatican spokesman said 87 international delegations had so far indicated they would be attending Sunday's solemn ceremony in St Peter's Square. Hundreds of thousands of pilgrims - including up to a quarter of a million from Poland alone - are expected to cram the square. On Friday, John Paul II - who is buried in three coffins - was exhumed from his tomb in the Vatican Grottoes. He is to be reburied on Monday in the chapel of St Sebastian in St Peter's Basilica after the beatification ceremony. Beatification, or declaring a person "blessed", is the necessary prelude to full sainthood. For this to happen, the Vatican must declare the person to have performed a miracle. In John Paul's case, a 49-year-old French nun, Sister Marie Simon-Pierre Normand, said she and her fellow nuns prayed for the intercession of the pope after his death to cure her from Parkinson's Disease. Her sudden cure had no logical medical explanation and she later resumed her work as a maternity nurse, the Vatican says. There have been reports that Sister Marie has fallen ill again since her recovery and that her diagnosis with Parkinson's Disease may have been incorrect. If the late Pope is declared to have performed another miracle he will be eligible for canonisation as a saint.